Pompons of the sort used for cheerleading. A bundle of yarn, string, ribbon, etc. 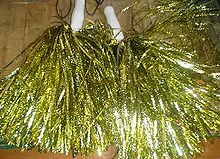 tied in the middle and left loose at the ends, so as to form a puff or ball, as for decoration or a showy prop for cheerleading. A hardy garden chrysanthemum with button-like flower heads. Any of several dwarf varieties of the Provence rose.